During the 1970s and early 1980s, Confederate Air Force air show crowds were amazed at the sight of Col Jim Thixton's Fieseler Storch occasionally taking off and even landing across 150 foot wide runways. Thixton, a skilled Storch pilot generous in his knowledge of the plane, taught a handful of younger CAF pilots to fly the Storch, one of which was Lanny Parcell. Parcell in turn introduced me to the mysteries of this strange-looking bird in 1985. First, the Storch has only one set of controls, and the prospective pilot must lean over the pilot's shoulder to observe the instruments and controls. In my case, I ended up hanging about half out of the upward-hinged main door on Thixton's Storch, which has a French-built airframe, as we began the first takeoff. With 20-25 degrees of flaps, the Storch does not exactly take off, but rather levitates off the runway, maintaining an almost level attitude as it climbs. Attempts to raise the nose to climb faster do nothing but cause the aircraft to slow down. Once at a safe altitude, the flaps can be cranked up, power reduced slightly, and the Storch settles down to a cruise of 80 to 85 mph. In the air, attempts to stall the aircraft just produce a mushy, wings level decent. Setting up for our first landing, I was still hanging out of the door watching, the pilot slowed the plane down and began cranking down the flaps. As the flaps passed about 30 degrees, the ailerons began to droop also, and with full flaps, the entire trailing edge of the wing seemed to be bent down. As the flaps came down and power was reduced, the nose lowered toward the runway at what one would have swore was at least 45 degrees. At this point, the pilot who seemed completely unaware of the impending crash, calmly held about 50-55 mph indicated. Just as I was thinking of jumping or maybe just falling out of the open door to escape disaster, the pilot hauled back all the way on the stick, closed the throttle and we landed  or should I say arrived. But strangely, instead of rebounding totally out of control at least 10 feet back into the air, the enormously long gear legs seemed to gently collapse and spread, and we didn't bounce or even bobble. We then turned off the runway at a taxiway just 75 feet from the approach end of the runway. Impossible. Airplanes can't do that! Thixton allowed me to fly his Storch several more times, and once, at a safe altitude in a steady 20 knot breeze, I almost hovered over the runway with the airspeed just above 30 mph. The next Storch I would fly would be the newest addition to the CAF Ghost Squadron. Obtained in California, Col Jay Cullum had ferried the newly acquired Storch to Texas in 19 flying hours  probably a record of some type. Due to problems with the brakes and spark plugs, Cullum was forced to leave the aircraft for several months at the Dallas/Fort Worth Wing hanger in Lancaster, Texas. 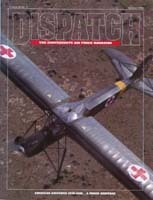 In 1990, however, the Storch was ready to be delivered to Headquarters in Midland, Texas. Cullum declined the opportunity to ferry the Storch to Midland  he said he had flown that plane enough thank you very much  and since I was the only other CAF pilot qualified in the Fi 156 available, I accepted the honor. I left for Midland on a beautiful sunny December day. Our new Storch was fitted with a communications radio but no other navigational aids, so course was set for the great concrete compass known as Interstate 20. With all the instruments reading in the original metric units, I decided to avoid controlled airspace as much as possible, to avoid having to convert altitudes from meters to feet, and speeds from kilometers per hour to knots. This plan worked, and after a while I finally joined the traffic west bound on IH-20. Due to some problems finding replacements for the unusual original spark plugs, the Storch's Argus 10P engine was not at its peak, so the airspeed only reached the equivalent of about 70-75 mph. As I neared Big Spring, about 40 miles east of the Midland airport, I was beginning to seriously question my own sanity in agreeing to this flight. Finally the town of Stanton was under my wing and I called Midland approach on the radio. "Midland approach, Fieseler Stork November 40 Foxtrot Sierra, 20 to the east over Stanton at 4500 feet, negative transponder, landing Midland International." The controller asked what I was a couple of more times, but I got the impression he still didn't have the foggiest idea when he advised "40 Foxtrot Sierra, make straight in for runway 22, report 5 miles out." It took another ten minutes to arrive abreast the skyscrapers of downtown Midland, still 10 miles from the airport. It was then that the controller called again with a somewhat worried note to his voice, asking for my position. When I told him, there was a short silence, so I added, "I'm at full cruise, flat out, indicating about 65 knots. I'll be there in another 10 minutes, over." And finally, after four and a half hours of flying, the Storch and I landed and taxied to the new CAF hangar and ramp. Mission accomplished. The CAF's Fieseler Storch on a photo mission near Midland, Texas, the headquarters of the Confederate Air Force. The plane's landing gear extends about 18 inches in flight, and this, plus the long wing, does make it look like the long-legged bird, after which it is named. As this shot shows, the pilots of both the photo plane and the "target" must be well briefed, as the pilot of the target (me, in this case) often can't see the photo plane as it maneuvers for some shots.